BOUM is a full analog stereo warming unit, combining an easy-to-use compressor, a versatile distortion generator and a smooth low-pass filter. BOUM is the perfect tool when you need to add warmth, thickness, and character to your sounds, but also apply severe distortion and extreme compression treatments. INPUT GAIN: boost your signal up to +18db to adapt BOUM to many signal levels, and also improve the distortion content and the compression sensitivity. COMPRESSOR: with a single knob, control the 3 essential parameters of a compressor, threshold, ratio and makeup gain, without thinking of how a compressor works. The ratio ranges from 1:1 (no compression) to inf. :1 (limiter), but also negative compression up to 1: -1 - 6 different Attack and release times are available for fine tuning. LO CUT FILTER: attenuate the distortion content of the bass frequencies, making your distorted sound easier to mix with the original one, with this 6 dB/Octave lo cut filter. DISTORTION GENERATOR: choose one of the 4 different distortion circuits, Boost - Tube - Fuzz - Square. NOISE GATE: remove the noise coming from the different treatments, or use it for interesting chopping effects. 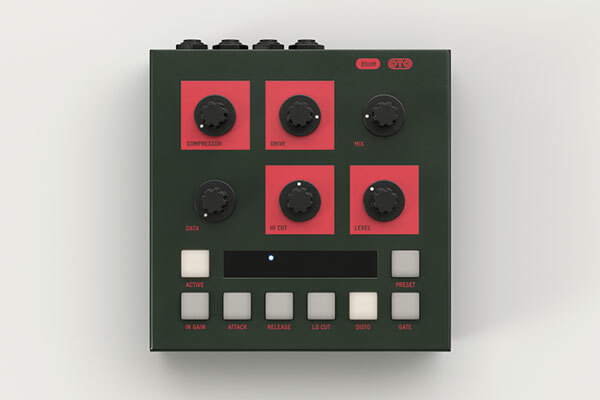 All these analog effects are packaged in a compact format, with 36 user presets and full MIDI control. BOUM will give you a wide range of compression, distortion and filtering effects, ranging from subtle harmonic enhancement to an insane square distortion, and everything in between.